The Queens Hotel Cheltenham occupies the site of a former historic spa that operated in the small town of Cheltenham during the early 1800s. In the early 19th century, entrepreneurs Thomas Henney and Samuel Harward rushed to Cheltenham to partake in the booming spa industry that was rapidly emerging in the area. The two constructed their facility in 1818, which they named the Sherborne Spa. The spa did not last for long, though, as it ran out of natural spring water two decades later. New owners then obtained the site, transforming it into a luxury hotel. Completed in 1838, the hoteliers christened the new building the “Queens Hotel” after Queen Victoria. Since then, the building has continued to host guests vacationing in the tranquil Cotswolds. 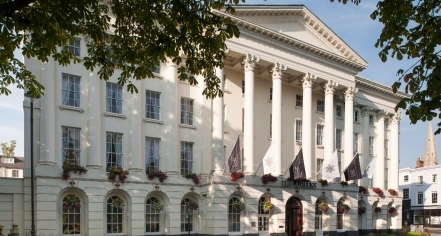 Today, Sofitel operates this wonderful establishment as the Queens Hotel Cheltenham - MGallery by Sofitel. Each of the hotel’s 84 guestrooms feature contemporary, vibrant designs that also preserve the hotel’s majestic heritage. Upon entering any of the lodgings, guests will find an exceptionally comfortable bed dressed in the finest cotton linens from Egypt. Every room also possesses luxury toiletries, a flat-screen television, and spacious baths outfitted with spa showerheads. The Queens Hotel Cheltenham serves wonderful lunch and dinner menus from the Napier Restaurant, which are guaranteed to satisfy every kind of appetite. Local Cotswolds farms and gourmet artisans supply fresh meats and produce, providing the inspiration for the Napier’s rustic cuisine. The Queens Hotel Cheltenham also has the Montpellier, an intimate bar with over 20 distinctive gins to sample. Guests can reserve the stunning Regency Suite for social gatherings as large as 100 people. The venue is terrific for any event, whether it is a small business meeting or a grand wedding ceremony. 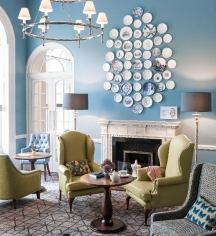 Queens Hotel Cheltenham - MGallery by Sofitel sits at a prime location in downtown Cheltenham, a place often cited as the most complete Regency town in England. Indeed, the hotel gazes across the Imperial Square and Gardens toward dozens of other spectacular buildings, including the Cheltenham Town Hall. From the hotel, guests can head southwest along the Promenade into the affluent Montpellier District for shopping and sightseeing. Guests can also catch one of the many festivals that Cheltenham hosts throughout the year, which celebrate music, literature, and food. Many visitors are especially allured by the town’s signature event, the Cheltenham Festival, home to the Gold Cup horse race. The hotel is also a splendid base from which to explore the surrounding Cotswolds. Renowned as one of England’s favorite destinations, the Cotswolds offers to guests fantastic gardens, bustling farmers’ markets, and a pleasant café culture. The Queens Hotel Cheltenham is wonderful for any guest looking to escape into the picturesque English countryside. Queens Hotel Cheltenham, a member of Historic Hotels Worldwide since 2018, dates back to 1838. The Queens Hotel Cheltenham possesses a rich military history. The building functioned as both a military hospital and a refuge for women during World War I. It then served as a social club for American G.I.s during World War II. Cancellation Policy: Cancellations must be made by 2pm on the day of arrival. Deposit: A credit card is required to guarantee every stay. Extra Person Fees: Fees apply. Hotel/Resort Fees & Taxes: All taxes and fees included in the rate. Pet Policy: There is limited access for pets – may be available on request. The Queens Hotel Cheltenham occupies the site of a former historic spa that operated in the small town of Cheltenham during the early 1800s. In the early 19th century, entrepreneurs Thomas Henney and Samuel Harward rushed to Cheltenham to partake in the booming spa industry that was rapidly emerging in the area. Learn more about the History of Queens Hotel Cheltenham .